For some time now I've been tentatively recommending CamRanger to other people for focus stacking with its AF motor control. But I've always had to admit that I had no personal experience with it. Well, last week there was an announcement that CamRanger now supports StackShot. That finally pushed me over the hump of getting one, so now I can see for myself how the beast works. 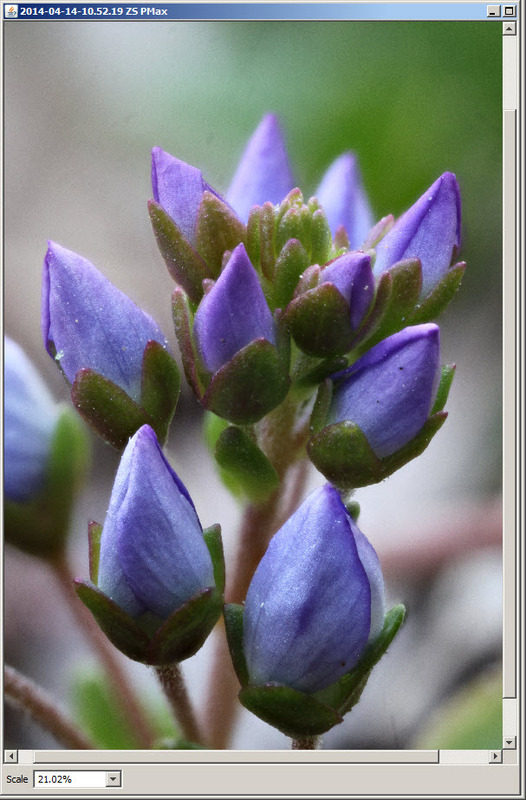 Starting with the results first, here is an image of some Veronica buds, shown as a screen capture of Zerene Stacker at work. There's nothing too special about the result, but the process was quite a bit different from usual. If you've read anything about the CamRanger, you know that it's a small white box that physically connects to your camera with a USB cable. The white box then provides a wireless connection to a GUI controller app that runs on your iPhone, Android tablet, or whatever. To add StackShot control, a USB hub gets inserted so that the small white box can plug into the camera and the StackShot controller at the same time. Of course you need latest firmware for the white box and latest versions of the apps also. 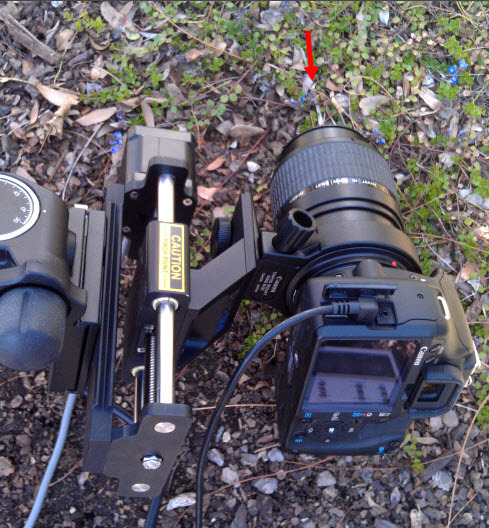 With that as background, here's the physical setup for shooting the Veronica buds. Clearly "wireless" is not the first description that comes to mind here. In fact this setup has a mess of wires, which I've made no effort to minimize in this picture. But notice that black Android tablet sitting separated from all the other stuff. There are no wires connected to the tablet, and that makes all the difference in the world in this situation. In operation (not shown here) I was using my body to shade both the subject and the tablet, watching a large live view image and controlling focus on the tablet, while dialing in framing with physical knobs on the geared head of the tripod. At no point did my nose come near the ground. Without the CamRanger, this shot would have been way too much trouble to bother doing. With the CamRanger, it was kind of fun. 'Nuf said. 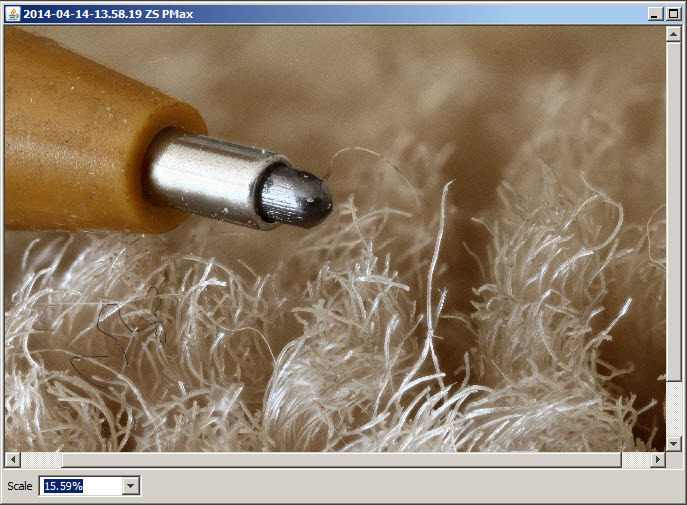 f/8 at 2X with MP-E 65, 14 images at 0.32 mm spacing as suggested at http://zerenesystems.com/cms/stacker/docs/tables/macromicrodof. Images recorded to memory card in the camera, then physically moved to computer for processing. Here's a closer view of the camera and the buds. Providing some further information, here are screenshots from an indoor setup where I could decently photograph the Android screen. I'll be happy to answer questions, of course. Do you need provide power to the USB hub? No, the hub picks up power from the white box, which has a 3.7V 2000 mAh battery in it. Setup looks great, over the last few months I have used manual setup on Stackshot with Camranger - but now with USB-Camranger hub sync the process will be smooth. I will be getting the Hub soon. 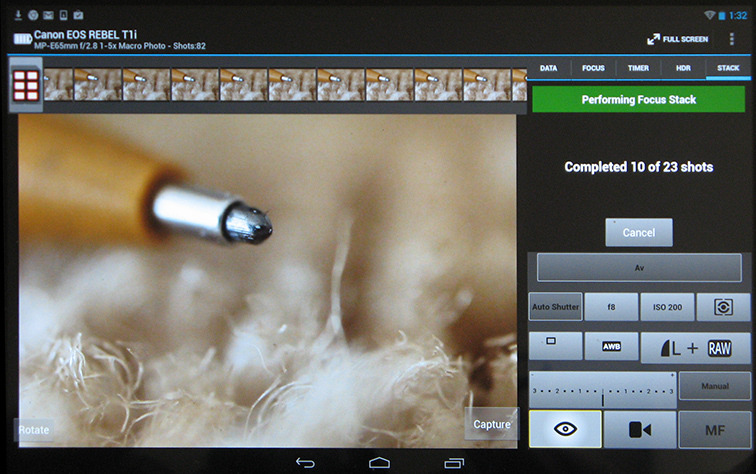 I am unclear on one of your Android tablet screen shot that showed something about Camranger “stacking”, I am assuming actual image processing was done later on your desktop ? Can you post a closer look on your setup. I am assuming actual image processing was done later on your desktop ? Correct. Windows 7 in this case. I'll be happy to, but I don't know what bits you are interested in. Here is some information to help decide. What aspects do you want to see closer? I'm not sure exactly what it is. There's a picture of it on page 30 HERE. It's a small black lump with several types of sockets on it. Carries the label "CamRanger PT Hub". In my application only the USB sockets are used (two A's, one B). But the hub also carries what looks like a circular 8-pin connector (center pin unused? ), plus possibly a small power jack. I do not know what those are, and both of them remain empty here. I have no idea whether any standard part could be used in place of the CamRanger PT Hub. I have edited my earlier post to clarify the identity of this device. How clear was the tablet screen & image detail when used outside? There is a heap of wires as you mentioned. It would be nicer if it all were wireless. The display of the Samsung Nexus 10 washes out pretty badly in bright light. Visually evaluating the image quality would have been very difficult. But I had no trouble setting up the framing and focus limits by using the tablet in the shade of my body on a sunny day. In full sun or very reflective surroundings it would have been much more difficult, maybe impossible. I didn't spend any time trying that -- just immediately turned to the shade. I had decided beforehand what aperture and thus what step size I needed. The CamRanger app offers a histogram for both live view and captured images, which I used to confirm that the exposure was correct. I was also careful to shoot raw, so that if there were color balance issues I could fix them cleanly in processing. It would be nicer if it all were wireless. I also acquired an original lead-acid battery some time ago. Then, I naively thought I would frequently use the Stackshot for field macro stacking, but the realities of tripod-based field stacking soon impressed themselves on me. Now I need to revisit that activity using the components you have described. Do you think it might be helpful in outdoor lighting to use something like a "Hoodman" loupe ("Hoodloupe") to get rid of the ambient light and to more precisely visually focus, etc? 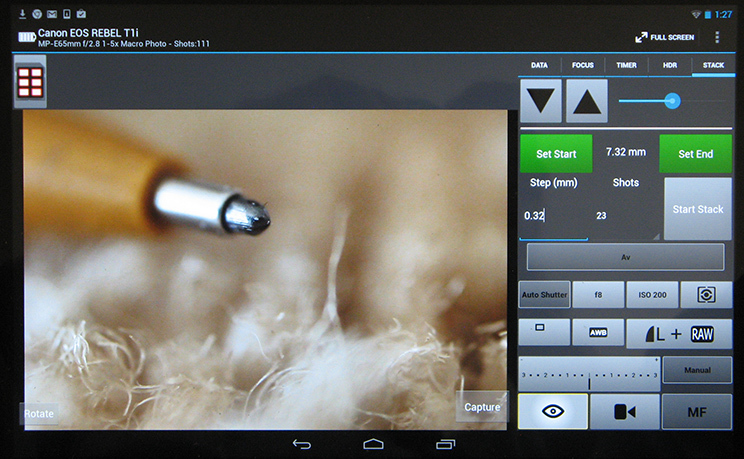 Since the tablet is wirelessly connected, one could presumably locate one's person in an ergonomically practical position while using a Stackshot field macro rig. Since these "loupes" are made to be attached to the LCD viewing screens of DSLRs, it's not clear to me that they would work practically as a handheld add-on to a tablet. While these new components help, it's of course still necessary to have a cooperative bug (or specimen) to do field stacking. At least now one can much more comfortably supervise the effort. Neither an optical viewfinder nor a camera LCD viewing screen is very comfortable in many field macro shooting situations. Do you think it might be helpful in outdoor lighting to use something like a "Hoodman" loupe ("Hoodloupe") to get rid of the ambient light and to more precisely visually focus, etc? I have a Hoodman loupe but did not think to try it for this application. Now that I am thinking about it, I'm not very encouraged. The main advantage of the tablet was that I didn't have to put my eye at some prescribed place to see what I was doing. Using the loupe would restore very much the same constraint, while also using up one more hand to move it around the screen of the tablet. Better, I think, would be to drape a black cloth over my head as if I were setting up a view camera. 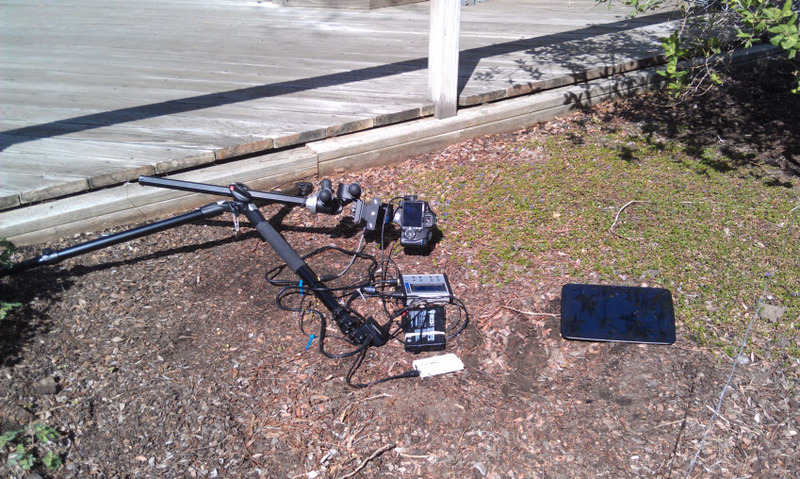 Just trying out camranger and find it quite slow between shots, is this rig faster? No, in most cases it will be slower because of settling time. AF motor control doesn't require much settling time (if any) because there's so little physical movement. With the StackShot, it's typical to set a couple of seconds although in many cases you can actually get by with a lot less. In a quick test I ran just now, a 5-shot stack using AF motor control took 20 seconds, while a 5-shot stack using StackShot took 31 seconds. BTW, I'm curious what "quite slow" means in your case. And I wonder if you have Auto-download enabled so that you're paying for transfer time between shots? Maybe I should have bought stack shot, I will have a look at the settings on the camranger and IPAD 1 and see what makes a difference wil get back to you.